Dragon fruit salads are popular among lazy cooks and hosts all around the world. 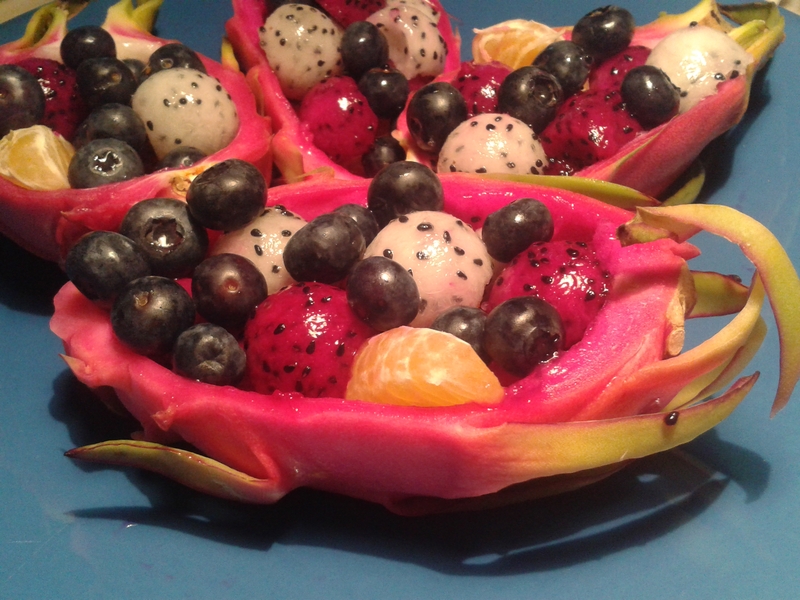 A dragon fruit allows you tp prepare a stunishing eye candy with putting hardly any effort into it. Scoop out the fruit meet with a melon spoon – forming little balls of fruit meat. Use the emptied dragon fruit peel as a bowl into which you can drap the fruit salad. In the picture I show a mixture of red and white dragon fruit together with blueberries and tangerine. The downside of a dragon fruit salad is that the looks are often greater than the tastes; especially in countries to which dragon fruit is imported into the fruit meat may have a very faint taste. It is a magnificent taste but very fine not fitting the catchy visual sensation of dragon fruit. There is an easy trick how to increase the taste of the salad: make a dressing of its own ingredients! In my case, I mixed 4 tea spoons red dragon fruit meat with 6 blueberries and the juice of a half a tangerine. The Dressing can be easily placed onto every sald as it fits the looks of the mixture. Important is that the dressing is sweet, so if you cannot use tangerine juice, use lime and a bit of honey.